This morning, it is with much sadness that I inform you of the passing of Sister Elizabeth Margaret, wife of The Revd. Dr. George Hood, the founder of this Church. Sister Elizabeth was promoted to glory on October 7 in Northumberland, England. She was 92. Her cremation funeral service was held last Friday, October 15. A thanksgiving service in celebration of her life has also been planned on October 30. I also regret to inform you that Rev. Hood is in hospital after he had a fall. The doctors have given him a new ‘hip’, and we pray and wish him a speedy recovery. 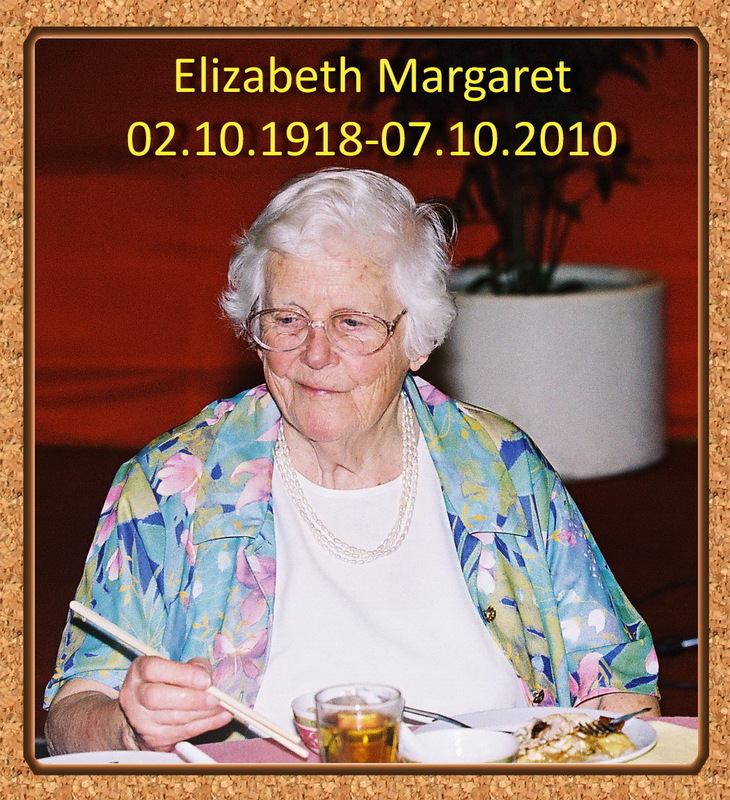 Members of this congregation, the late Sister Elizabeth was born in Shantou (or historically known as Swatow), East Guangdong, China on October 2, 1918. This was also an area in which her parents and grandparents had worked as missionaries from 1869 onwards. At the age of eight, she was sent to England for her education. She was trained as a nurse, and worked as one between 1937 to 1945. The couple first met in December 1939 when Rev. Hood was studying at the Westminster College, Cambridge for the ministry of Presbyterian Church of England. They were married on July 24, 1943. She then joined Rev. Hood when the latter became a missionary of the Presbyterian Church of England in the Lingdong Synod of the former Church of Christ in Shantou. In 1950 and a year after the Communist takeover, they returned home on leave. When due to return to China it was no longer possible for missionaries to work there. So along with many others of the various mission bodies, Rev. Hood was redeployed to Malaya. They came to Malaya in February 1952 after the English Presbyterian Mission appointed Rev. Hood as the resident moderator of Holy Light Church (Chinese). It was also at this time whilst on their way to Malaya, Queen Elizabeth Alexandra Mary ascended to the throne as Queen Elizabeth II on 6 February of that year. Their first child, Catherine was just an infant then. Their second child, Douglas was born here in Johor Bahru in 1953. It was on August 3, 1952 that Rev. Hood revived the English speaking service of Holy Light Church. They served in the ministry of Holy Light Church (English) from 1952 to 1959 and then 1967 to 1969. This picture was taken in March, 2003 during their visit to this Church and at a dinner hosted in their honour by our office bearers. Affectionately known as mu shi niang (pastor’s wife) to the congregation and ang moh so (red-haired auntie) to the stall owners in the Johor Bahru market, older members of the Chinese congregation still fondly remember Sister Elizabeth as an able helper to Rev. Hood during his ministerial service here. She played the role of a pastor’s wife effectively, preferring to stay behind the scenes supporting her husband as well as looking after Catherine and Douglas. Elderly members of Chinese church also remember her caring nature especially taking a keen interest in the children’s ministry. During her time here, she would often get involved in charity work with special attention given to underprivileged and handicapped children. Though by nature a quiet person, she was very friendly and was still able to hold a manageable conversation in Teochew with the congregation. She loved photography too. Today, we pay tribute to her for her faithful service and contribution rendered to this Church especially to the early growth and spiritual development of this Church. I therefore respectfully request that you rise to observe a minute’s silence as a mark of respect for our dear departed Sister Elizabeth Margaret. Congregation of Holy Light Church (English) observing a minute's silence for the late Sis. Elizabeth. 从您的网页能够获知有关胡德牧师及牧师娘的最近消息. 更特别得到您及时给我的外甥有关与胡德牧师联络的电话号码和通讯地址. 内心非常感激! 因为正在海外旅行,未能及时作复致意, 失礼之处敬请见谅.